UNITED NATIONS (FinalCall.com) - A majority of the 193-member UN General Assembly voted to demand an end to the U.S.-led Cuba blockade for 23rd consecutive year as the Caribbean nation’s foreign minister reported that the embargo has cost the Cuban economy more than $1 trillion. Speaking before the vote, Russian ambassador Vitaly I. Churkin said a swift lifting of the embargo against Cuba was a necessity. The United States embargo was not in line with the UN Charter and was having an negative impact on international relations, said Mr. Churkin. “I support the draft resolution before the Assembly and urge all others to vote in favor as well,” Amb. Churkin said. 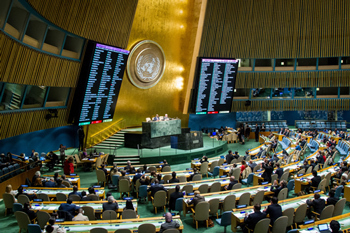 Ambassador Gholamhossein Dehghani of Iran, speaking on behalf of the Non-Aligned Movement, said these countries have always called for the United States to end its unilateral economic, commercial and financial embargo against Cuba. “The United States denied Cuba access to markets, development aid and technology transfers as well as creating impediments for Cuba’s socioeconomic development,” the Iranian delegate said. The embargo is also the main obstacle to broader access to the internet, ideas and the development of cultural, sport and scientific relations, he added. Continuation of the embargo is unjustifiable, the Iranian diplomat said. Chinese Ambassador Wang Min said his government hoped the United States would end its blockade against Cuba as soon as possible. “China and Cuba have maintained normal economic and trade relations, and that approach is conducive to Cuba’s economic and social development,” he said. Bruno Rodriguez Parrilla, minister of foreign affairs of Cuba, said the commercial and financial blockade had been tightened and strengthened through U.S. imposition of unprecedented fines, totaling $11 billion against 38 banks, including the French bank BNP Paribas, for carrying out transactions with Cuba and other nations. 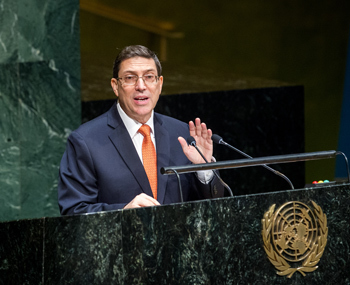 “Cuba would never renounce its sovereignty or the path chosen by its people to build a more just, efficient, prosperous and sustainable socialism,” Mr. Parrilla said. Neither, he continued, will Cuba’s government give up its quest for a different international order, nor cease in its struggle for a more equal world. 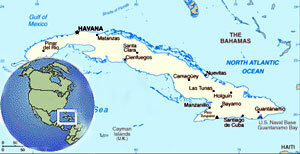 Prior to casting his vote, Ambassador Ronald D. Godard, a U.S. senior area advisor for Western Hemisphere Affairs, said the Cuban government uses the annual resolution to shift blame for the island’s economic problems away from Cuban policy failures. “Our sanctions toward Cuba are part of our overall effort to help the Cuban people freely exercise their human rights and fundamental freedoms, and determine their own future,” Mr. Godard said. He gave an example of U.S. so-called generosity to the Cuban people: The U.S. exported approximately $359 million in agricultural products, medicine, medical devices, humanitarian aid and $2 billion a year in remittances and private contributions. One speaker after another, however, noted that Cuban medical efforts over time place the island nation head and shoulders above those critical of her revolution. According to BlackAgendaReport.com, Cuba has sent 76,000 medical specialists to serve in 39 African nations over the years. “With 461 doctors, nurses and other health professionals either already on site or soon to be sent to Liberia, Sierra Leone and Guinea; Cuba sets the standard for international first-response,” the article noted. “Cubans have once again demonstrated the advanced nature of their society in that they have the ability to help others while suffering from the embargo,” analyst Bill Fletcher, Jr. told The Final Call. He expressed hope that intelligent officials in the Obama administration would win the fight to discontinue the embargo. A recent poll by the Atlantic Council, a think tank, suggests 56 percent of the U.S. public polled wants to see the embargo ended. In Florida, which has been an anti-Fidel Castro stronghold for Cuban Americans, a surprising 63 percent of those polled supported normalizing relations with Cuba.